The lipid droplet is a cell organelle and would have been a primitive protocell produced by abiogenetic evolution. Lipid droplets are the original protocell. The cosmic egg can be considered to be tetrapyrrolic porphyrin rings which have a wave and particle existence and can come out of nothingness. The porphyrions would have constituted a template for the formation of an isoprenoidal lipid organism which can multiply by fission. The ubiquinone and porphyrions would have constituted an original electron transport chain for generating energy. 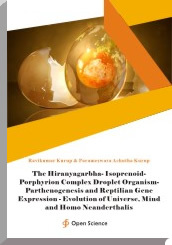 The porphyrion lipid droplet organism would have been the original protocell and universal cosmic egg. The porphyrions are capable of quantal perception and porphyrions arrays are capable of functioning as quantal computers for information storage. The porphyrions would have been a template for generation of RNA viroids, DNA viroids and prions which along with lipid droplet isoprenoidal organism would have evolved into primitive self-replicating archaea on porphyrion templates in the intergalactic space. The lipid droplet organelle is evolutionarily the original protocell and primitive archaea and forms the basis of endosymbiosis and neanderthalisation.